A dig at Twilight/Harry Potter perhaps? As always, excellent comics with a great sense of humour behind them! I am reminded of almost every James Patterson book...which I still continue to read. But refuse to own now. Sad how formulas like this work. What happened to creativity? I hate to admit how true this is, but when put in such frank terms, it is really extremely comical, and stupid. I do really love your style, though, so thanks for doing this topic. More people need to get this point. At least the author will be contributing something to the masses--a way to pass time... I mean, that cannot be emphasized enough. thanks for the all the comments! 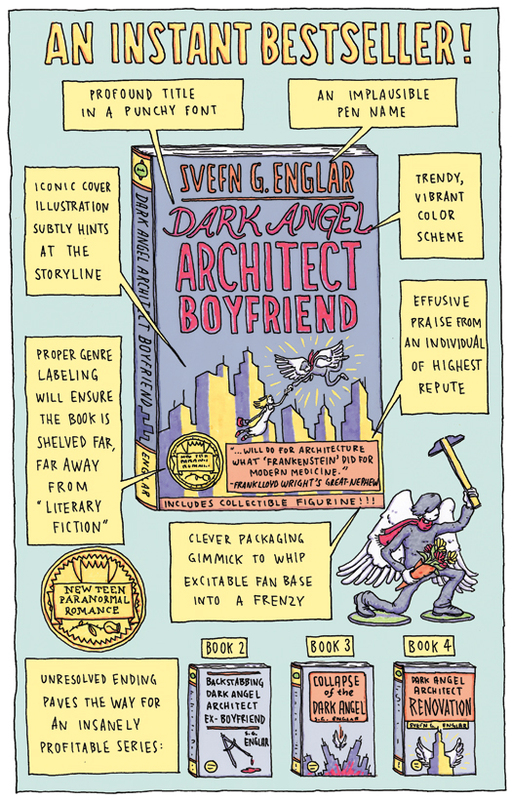 I'll be giving up cartooning to write the Dark Angel Architect Boyfriend series... just as soon as I can sell the movie rights. I would like to give you "KREATIVE Bogger Award. If you like to accept it please go on my site and copy it and paste it on your site. After every one who I have offered it to have accepted it, I will write every one's name with their site name. Also you have to write five facts about yourself. I still have to do that. I am too busy right now. I will however catch up pretty soon. ahahaha, very interesting and true about books hahaha! Love it. Extra points for the Sigur Rós reference.